If you’re reading this you’re probably planning a trip through the Balkans. Great, you’ve come to the right place! You should start by reading our guide to planning a Balkans road trip full of tips and FAQs about the logistics of your trip and route through the Balkans. Already read it? Then let’s get planning! I’ve created this guide to help you find the best stops on a road trip through the Balkans. This post covers the best things to see in Montenegro, Albania, Macedonia and Bulgaria. If you’re heading to Slovenia, Bosnia and Herzegovina, Serbia or Kosovo read all about them here. Right, down to the nitty-gritty. The best places to visit in the Balkans. This is a hard one as we really love more off the beaten path locations and didn’t have time to see everything in every country (obviously!) But the many of the popular places are well worth seeing too. The great thing about road tripping in the Balkans is that you can get to places that are harder to reach by public transport and you get to see a whole lot more along the way. So here are our favourite places to see in the Balkans. This tiny country is home to just 300,000 people but packs a huge punch in terms of tourist appeal. Mountains, canyons, lakes, coastline – Montenegro has it all! So much that we wrote a full Montenegro itinerary, but here are the highlights. Montenegro uses the Euro so tends to be a little more expensive than its neighbours. But it is still possible to do Montenegro on a budget and even easy in the less touristy areas. So, where to visit in Montenegro? This is home to the Tara Canyon (the deepest in Europe) and the Black Lake. If you’re an adventure lover there’s white water rafting, canyoning, climbing and some epic hikes. If you’re more like us and love a mildly challenging walk with some good views and preferably a café at the end then your needs are catered for too. There are some great campgrounds if you have camper van or tent, we had a great stay at Camp Kod Boche. If don't have any camping gear have a look at accommodation options in Zabljak. Or head a little further off the beaten path and stay in the gorgeous Etno Selo Nevidio. This is probably the most touristy areas of Montenegro or even the Balkans in general. It’s a stop of for cruise ships, bus tours from Croatia plus all the usual European tourists on their summer holidays. But don’t let it put you off! Kotor itself is beautiful and the area around is so stunning you could stare all day. There are definitely parts of the bay that are quieter and cheaper. Another area of natural beauty, another complete contrast in scenery. 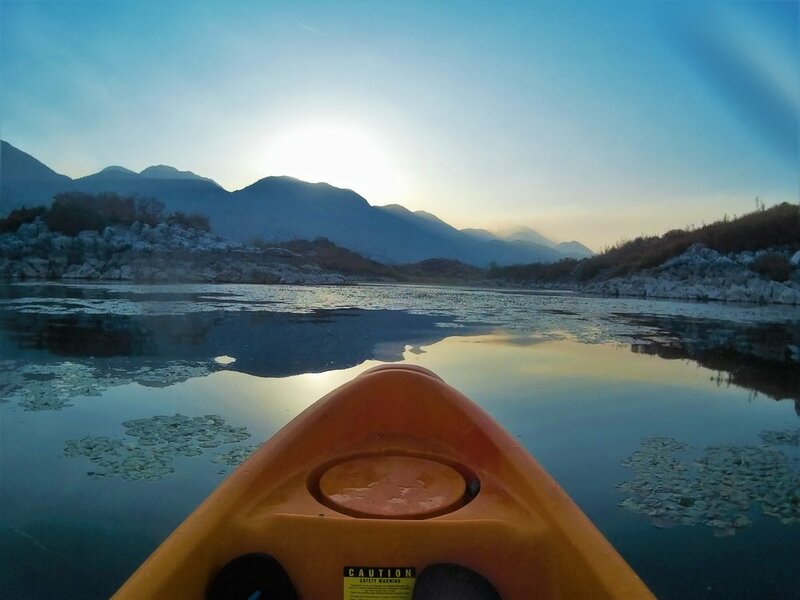 Lake Skadar is between the coast and the capital, Podgorica. It is a huge lake which is two thirds in Montenegro and one third in Albania. It’s a great place for bird watching, kayaking and boat tours and hiking. There were a lot of bush fires when we were there and the lake was extremely dry. It was still really beautiful but swimming wasn’t so nice and lots of the surrounding areas were burnt. We stayed at the B&B Skadar Lake Murici which had cabins for guests as well as place to park a van or pitch a tent. They hire kayaks to visit the nearby island and offer fresh fish meals. Check prices here. Albania completely surprised us and stole our hearts. We spent the longest time here of any country on our Balkan road trip. From hiking in the Albanian Alps to wild camping in the Albanian Riviera we loved every minute of our time here (well minus the dog-biting and crazy storm minutes). 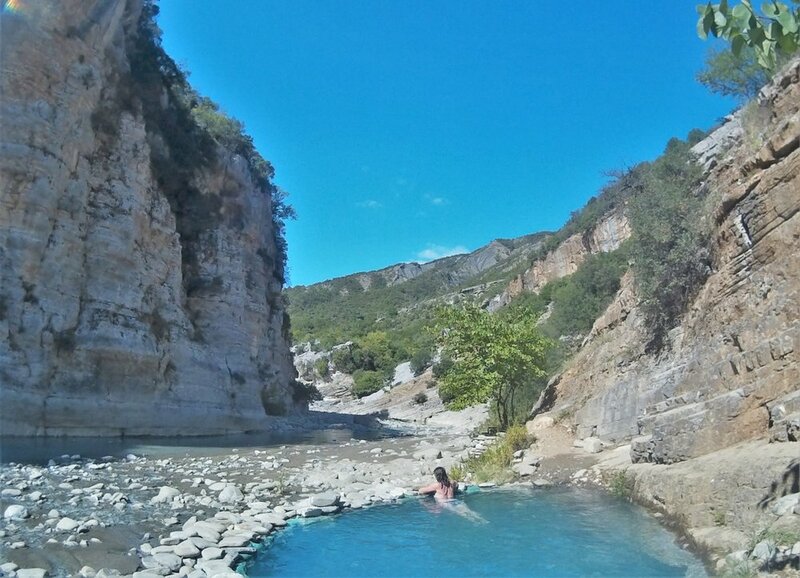 There are so many amazing things to do in Albania that we wrote a list of 20 of them. But in case your short on time here are the top ones! 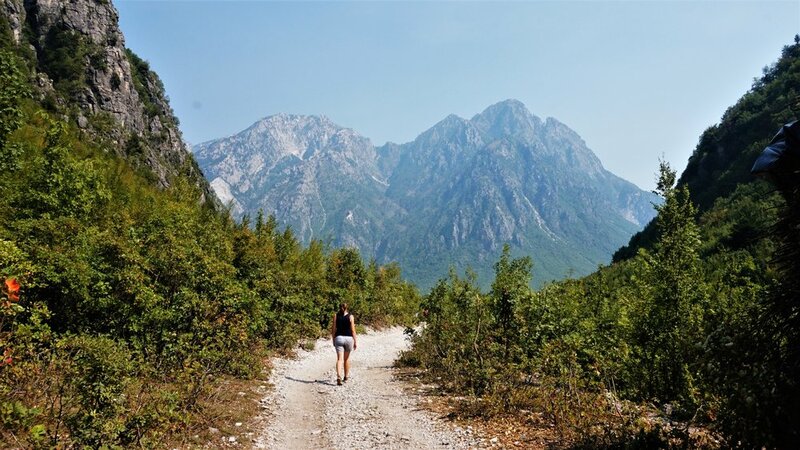 The Albanian Alps are not the most well-known area (we’d never heard of them!) but they are an excellent place for hiking and adventuring. We took a taxi to Theth and hiked to Valbona National Park before taking the ferry back along the Komani lake. There are so many amazing landscapes in this part of the country and this trip is the perfect way to see a bit of everything in just a few days. Ahhh Albanian beaches! Think the waters of the Caribbean Islands but the tourist levels of..well, Albania. Which is not very high. In September we had the beaches to ourselves and some of them are simply stunning. I think the picture says it all. We liked the beaches around Himara the best but pretty much the entire coast guarantees the good stuff! If you're staying in Himara have a look at Himara Hostel for budget double and dorm rooms. Or Bourbos Rooms if you prefer an apartment. Saranda is also a popular area and has some good options for day trips. Or if your feel like relaxing there are good beaches, cafes and plenty of things to do in Saranda. A little bit weird, a little bit rough-round-the-edges but totally funky and hip. Tirana is a city for eating, drinking and being wowed by odd tourist attractions. Like the giant abandoned pyramid on the city centre or the museum in a bunker. You definitely need to spend some time exploring Tirana. For a budget option with doubles, dorms and even tents on the rooftop try Hostel Albania. If you have a bit more time in Albania make sure you don’t miss this part of the country. It has some incredible landscapes but also some really awesome places to stop. Gjirokaster is a UNSECO World Heritage Site and is a pretty, little old town with a twist. All the roofs are made from stacked, flat stones which seems an odd idea but totally works and looks very cool. The castle is also worth checking out. We stumbled across the hot springs by accident looking for a place to park for the night. We couldn’t believe our luck when we rolled up next to some hot sulphur springs in a beautiful gorge. There are pools to soak in, a gorgeous old bridge and hardly anyone else around. It costs 200L for 2 people and parking. Stay in a beautiful traditional house at Old Bazaar 1790. We arrived in Macedonia at the end of our Balkan road trip and wished we had a little more time, and better weather, to enjoy it. It is definitely on the cheapest countries in the Balkans and has some amazing nature to explore. So if Macedonia is high on your list leave yourself more than a week. But in a week you should start with Lake Ohrid and Skopje. This lake sits right on the border to Albania and there are plenty of things to do in the surrounding areas. We stayed at the amazing Camping Rino campground right on the banks of the lake and from there we were able to visit Ohrid, hike in the mountains nearby and explore the other small towns on the lake’s edge. The city of Ohrid is a must-see and is home to 365 churches! Yes, on for every day of the year. The old town itself is really lovely and there are lots of great restaurants and cafes with lake views. A little further round the lake you can also visit the Museum on Water also known as Bay of the Bones, an archaeological museum about a settlement discovered on that exact spot in 1997. We heard pretty poor reviews of Skopje from a variety of people including tourists and locals. But after spending a few days there we still couldn’t really work out why it gets such bad press. Sure, it’s a little bit weird (like all Balkan cities) and it’s a lot smaller than many others but the old town is charming and the ridiculous sculptures everywhere add a fun twist. We had heard a lot about Sofia and while we spent some time getting over the shock of being cold again we still had a great time. The city has some amazing history shown through beautiful buildings and even some ruins displayed in a metro station. There’s great food culture here and a whole range of free tours which give you a different take on the city whether it’s graffiti, food or cycling focused. We found Sofia to be a bit more expensive than the other Balkan countries so we wrote a handy guide on how we stuck to our budget in Sofia. This is Bulgaria’s second biggest city but it feels very different to Sofia. It has a small old town with a great café and bar scene. There are some historic sites such as the amphitheatre and the castle ruins which are all easy to visit in a day. But the city will draw you in with its chilled out vibe and you might spend an extra few days sipping coffee and watching the world go by. We really enjoyed our stay in the beautiful old building with historical furniture and paintings but still modern facilities. Have a look at Guest House Old Plovdiv. It was a bit above our usual budget so if you're looking for a cheaper option try Hiker's Hostel. This is very out of the way but really worth the mission. 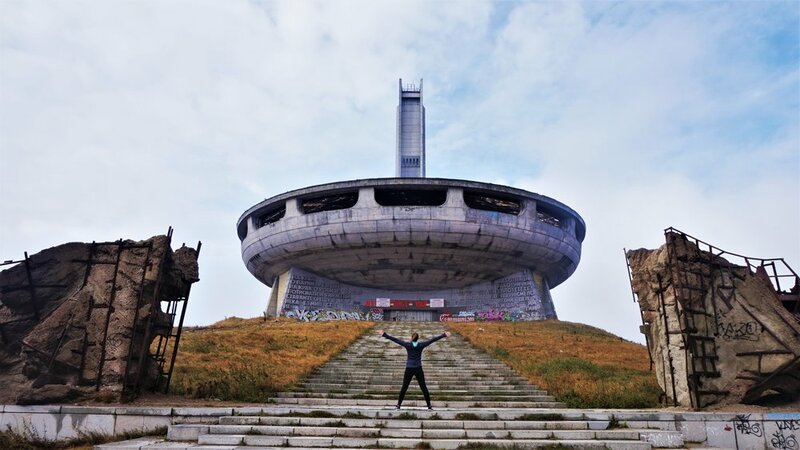 What if I told you that you could drive into the Bulgarian mountains and see an abandoned UFO-like building standing at the top? True story, it’s the old meeting house of the Bulgarian communist party and it sits on top of the mountain surrounded by amazing views. There are stories of people being able to get inside but the entrances get closed by authorities, so we couldn’t find any. It’s very impressive from the outside though and on a clear day the views are amazing. For more information read this article about getting to Buzludzha. There are, of course, plenty of other places to stop on a road trip in the Balkans. But if you get to these ones you will have seen a good variety of areas and enjoyed some of the top places to see in the Balkans. Feel free to ask any questions in the comments below or drop us an email!